How long have you lived in Bridgeport? I moved to Bridgeport in 2007, but attended Bridgeport schools starting in 4th grade at Johnson. My mom, Mary Frances Smith, started working at Bridgeport High School in 1998 and it was more convenient to go to school near her. Where are you originally from? I am originally from Clarksburg. Are you married? Yes, I am married to Mathew Barnosky. We have been married for three years and have been together for eight years. Children? 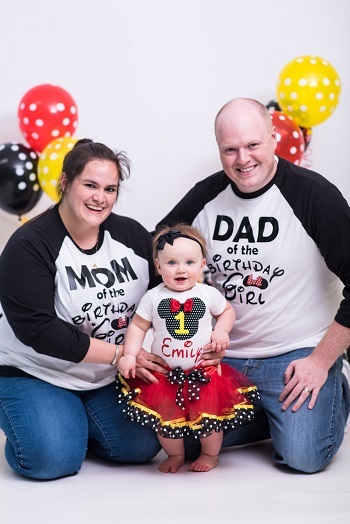 Mat and I have a 14-month old daughter, Emily. Where do you work? I work for Harrison County Board of Education as a School Psychologist. Favorite Bridgeport spot? I love spending time at home (I am a bit of a homebody) and enjoy walking around my Briarwood neighborhood. Favorite WV spot outside of Bridgeport? I enjoy spending time with family on our boat at Stonewall Jackson Lake. Favorite place outside of WV? It would have to be Disney World. I have been there quite a few times and am a bit of a Disney geek. We are currently planning a family vacation for next year. Favorite restaurant? My favorite restaurant would have to be Muriale’s. Best childhood memory? Growing up, my family and extended family would vacation in Rehoboth Beach, Delaware almost every year. I enjoyed riding bikes on the boardwalk with my grandparents and going the Funland in the evenings. Favorite musical group? I enjoy listening to anything country. My go-to artists right now would have to be Chris Young, Lee Brice, or Darius Rucker. Pets? We have one black cat whose name is Kitty. She turned 20 years old in May. The running joke is that she is going to outlive all of us. Hobbies? I enjoy crafting in my free time and in the last few years have tried to start golfing. Interesting fact about you? I was the West Virginia Italian Heritage Festival’s Regina Maria the 34th.